Words can't describe the pain I feel inside. My heart continues to beat but I don't feel alive. My children wake up on Christmas Day. But their father was killed the night before and I don't know what to say. How do I explain to my children that their father will no longer be coming home. Last minute gifts was what he wanted for his kids on Christmas Eve. Josh has more gifts than jade. "I have to get one more gift for jade" is what he said. Tyrone always went to the Extreme for all 4 of his kids on Christmas. Last minute gifts. "This will be the greatest Christmas ever" is what he said. He would spend hours putting up the tree. Making sure the decorations were in place and the lights shined brighter than the neighbors. "People will drive by our house and stop their cars to look at our tree" is what he said. Last minute gifts. He would set up the train set around the base of the tree and eat most of the candy canes before they were hung. Smh. I think at times he was more excited than the kids. Who would have ever thought these last minute gifts would cost him his life. What type of person would take a life in front of a child. My children are fatherless because of a thoughtless act of rage. Something that could have been totally avoided just by walking away. Tyrone was an awesome father, a thoughtful son, a caring brother and a loving husband. 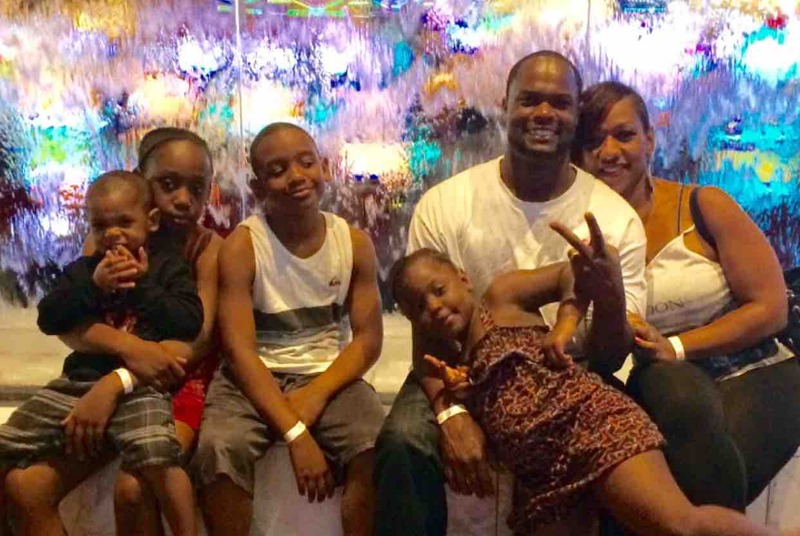 Tyrone Griffin Jr was stabbed to death on Christmas Eve at the Hayward target buying last minute gifts for his children whom love him dearly. God has taken one of the greatest gifts I've ever received. Even though you blessed us with your short time on this earth, I truly thank God for you Tyrone cause you were more than our "last minute gift"
There may be senseless violence in the world, but the way people are responding proves that there are so many good & caring people in this world! That is encouraging. Meeting this goal that Nicole has set will mean that each of Tyrone's children will have a fund which will help towards their future education needs. He certainly would want that and this is one way to bless the memory of Tyrone. I deeply apologize for your loss my love and prayers go out to your family. I am here. 510. 938. 4996. I know your family is devastated, and that no words can come close to taking that pain away. I'm praying for your family. And I truly hope you all can heal from this tragedy in time. He seemed like a wonderful person and father. I can't donate right now as Christmas wiped us out, but you have our prayers and deepest sympathy. Just know that a lot of people are thinking of you. My father was murdered when I was 7 and now I am almost 40. You never forget or get over it. This is horrible and should have never happened. I am so very sorry for your entire beautiful family and esp for the little one that witnessed it. I hope these scumbags get life and get what's coming for them in jail. I am sorry from the bottom of my heart. I believe Tyrone was a student of mine. As a quiet leader he sometime missed school to work on a traveling carnival, because he knew early on it took money to survive. I'm glad he grew up to be a good man with a loving family. Many blessing to his loved ones. I will love to help, I can cook some food for the family. I am so sorry for your lost, I really felt so bad for your children, My daughters and I tried to comort them both as much as we could. May God bless you all. Thanks to everyone. Tyron was a great Man and a Real Man his family and kids was his life. He loved hard! This hurts bad!!!! I know he would be touched if he knew how many people poored out their hearts for him. He will always live through us and his love babies. We are going to miss him. Not to mention he was a great mentor to all his newpew's and niece's. How he love the kids. Heart is Broken till we meet again Bra!!!!! There are two gofundme accounts for the deceased as I type this. The other one seems suspicious but I could be wrong. My condolences to the family. im so sorry for your loss. our pops was shot and killed last year by a man he didnt even know!! im praying for you, your family and your beautiful babies!!! This has burrowed into my heart. I'm so, so sorry. My heart breaks for you and your kids. Your husband sounds was a beautiful human being and a wonderful father. So sorry for for your loss. I can't imagine what you and the kids are going through.